Financial Roadshows in Scotland calls for a highly experienced corporate Chauffeur driven vehicle. When you have important meetings scheduled throughout the day and a network of journeys across the city to make, a professional, experienced Chauffeur will ensure you arrive on time and in style. Whether your timetable involves meeting with investors, existing or potential clients, we know that accurate timing is essential. Especially when meetings overrun or times are changed, there’s no room for error. We pledge to treat your business and appointment timetable as if they were our very own. This leaves you free to focus on the day ahead, in the knowledge that your highly experienced Chauffeur will ensure a prompt arrival. saying, all discussions in the vehicle is treated with utmost confidence and discretion. We may not be able to take away all the stress out of your financial roadshow, though our Chauffeurs will ensure you get your from A to B in the most relaxed, timely and efficient manner. Our fleet consists of luxury vehicles, seating up to 7 people. Your Chauffeur can either be dressed in a Kilt or a Suit, whatever you prefer. 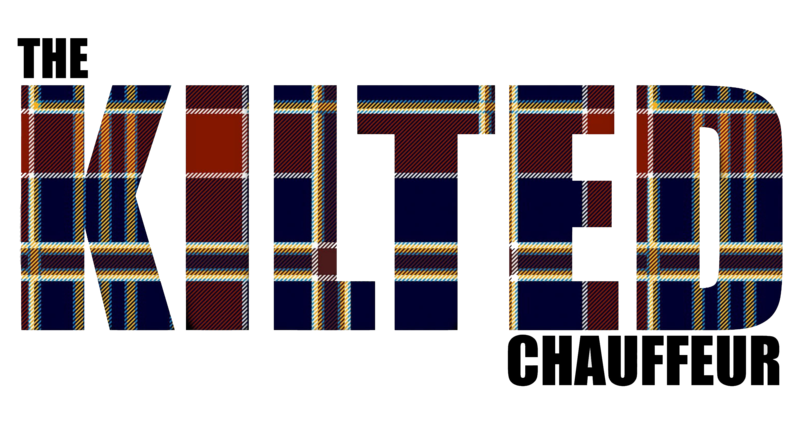 If you are considering The Kilted Chauffeur for your next event, please forward your proposed itinerary to info@thekiltedchauffeur.com. We will advise on timings and offer ways we can improve the route as well as cutting down on the time needed to journey from A to B, making your roadshow as relaxed as possible. Whether you have planned a corporate event for your entire company, a few colleagues or as an opportunity to network with your clients, we know what you expect and how to deliver it. We fully understand the needs of corporate clientele and have long realised that in order to stand above the competition we have to consistently exceed your expectations. This means providing a first class Chauffeur backed with meticulous planning. Only then you can sit back, relax and leave the detail to us. This commitment to offering the ultimate service leaves you free to concentrate on the task at hand, to network and enjoy the event. Wherever your event is taking place, The Kilted Chauffeur, will provide, faultless management, style, class and prestige all hallmarks of our Chauffeurs.